Cooney was in Dublin today for a sponsor's event with Kingspan. IAN KEATLEY’S REMARKABLE display of mental resilience and resurgence in form is fast becoming the story of the season, but John Cooney is making a strong case up north as he enjoys the next chapter in his career. The scrum-half’s switch from Connacht to Ulster during the off-season raised a couple of eyebrows, largely because fans were still up in arms about the IRFU’s insistence that Ruan Pienaar was to leave in order for the northern province to develop a home-grown talent. Cooney, the 27-year-old who had come up through the Leinster academy but moved out west in search of further opportunities but found himself behind Kieran Marmion in Galway, was identified as Pienaar’s replacement; big shoes to fill, then. His decision to leave the Sportsgrounds and start again in Belfast was a brave move by Cooney, but he has seized the opportunity and made the most of an extended run of games. The signing of the season? No question. 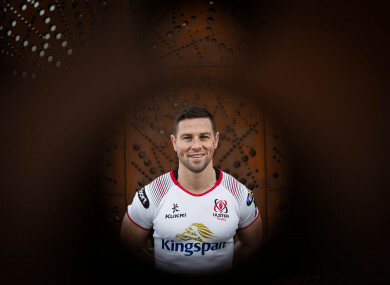 Cooney has really benefited from the exposure he’s gained at Kingspan Stadium and in becoming Ulster’s first-choice nine, the former Gonzaga College man is beginning to fulfil the potential he’s always showed. Last Friday, he helped himself to a personal tally of 27 points as Ulster ignited their Champions Cup campaign with the second of back-to-back wins over Harlequins, and the Dublin native has been the outstanding and most consistent performer so far for Les Kiss’ side. He has featured in all but two of Ulster’s 14 games this season and his instalment as the first-choice goal-kicker has seen that part of his game really develop, with Cooney racking up 109 points already this term. “I’ve been very happy with how it’s gone so far,” he says. “But sport is fickle and you can be the talk of everyone one week and then if you don’t perform well the next week everything can change. I understand that and understand how important it is to perform every week. After coming up through the Leinster system, Cooney played 27 times for his home province during four seasons but moved to Connacht in June 2014 on an initial loan deal before making the switch permanent. The former Ireland U20 international spent two seasons out west but his opportunities under Pat Lam were limited due to the presence of Marmion and a series of frustrating injury layoffs. “I’ve always been working hard and sometimes I just didn’t get the opportunities I wanted and for me, it’s not that surprising [about the good form] because I know I’ve done the work,” Cooney continues. “That’s the main thing for me, if you keep tipping away and keep believing in yourself it’s going to happen eventually. I had my family always telling me it was going to happen. Cooney has always shown good potential. His passing and decision-making have sharpened during his time in Belfast, and certainly, his ability from the tee adds another string to his bow. The Dublin native was included in Joe Schmidt’s squad for the summer tour of USA and Japan and made his international debut in the second Test against Japan in June. But despite his bright start to life with Ulster, Cooney was overlooked for the November Tests as Marmion and Luke McGrath were selected as Conor Murray’s understudies. Cooney’s performances and overall contribution has caught the eye of Schmidt and he was in Carton House at the start of the week for the two-cap camp as Ireland’s preparations for the Six Nations began in earnest. The squad for the 2018 championship won’t be finalised until the final round of the Champions Cup pool stages at the end of January, but for now, Cooney knows he just needs to keep doing what he’s doing. “I followed John for a number of years since I’ve been here in Ireland and once we had that decision to make we went straight for him and it was great he had confidence in our rugby programme and what we’re putting together, so it was great to see him come,” Les Kiss says of his scrum-half. “What he can deliver was never a mystery, it was just trying to get him to fit into the team we are and the new style that we’re trying to develop in our rugby programme. He’s added extreme value to that. Les Kiss, Iain Henderson and John Cooney were speaking at Kingspan’s Ulster Rugby media event in Dublin today ahead of Saturday’s interprovincial derby with Connacht. Kingspan delivers high efficiency, low cost, low carbon building solutions and is the naming rights partner and front of jersey sponsor of Ulster Rugby. Email “'You need to keep believing in yourself. I had my family telling me it was going to happen'”. Feedback on “'You need to keep believing in yourself. I had my family telling me it was going to happen'”.